The Pimcore Tags functionality is primarily designed as Pimcore Backend UI functionality for tagging and filtering elements. Nevertheless sometimes it can be quite useful to implement custom frontend filtering functionality based on the Pimcore Tags. Preparation of data for your template strongly depends on our template and how you want to visualize the tag hierarchy. For example you can build a tag tree based on bootstrap treeview. //select parent node for tags or use all root tags. For filtering elements based on tags some advanced queries on the element listing are necessary. Have a look at the following example for filtering and asset listing. Listings for other elements work the same way. Tags and their hierarchy are stored in the table tags. 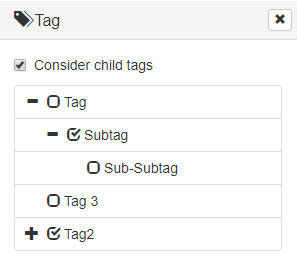 The table tags also has the column idPath which is useful for filtering for tags including their child tags. Tag assignment to elements is stored in the table tags_assignment. SELECT cId FROM tags_assignment WHERE ctype = 'asset' AND tagid = " . intval($tagId) .